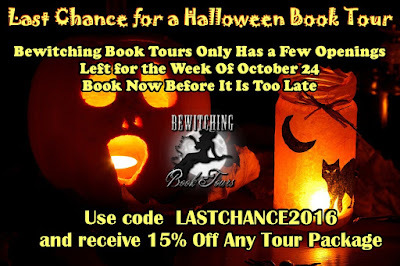 Bewitching Book Tours Has A Few Openings Left the Week of October 24. If you do a one week tour it would go from October 24 right up to Halloween on the 31. Grab your last chance tour with a great sale price of 15% off any package. Best sale price of the year. Use code: LASTCHANCE2016 to get 15% off any tour package booked by September 30. This offer cannot be combined with any other discounts, sales or special offers.